Two years after the financial crisis, economies worldwide have started to recover. Banks and financial institutions, however, have not benefitted as much as they normally would, as GDP growth no longer automatically translates into increased customer confidence, especially in developed markets. Households and business clients have remained tentative about entering long term borrowing contracts and have created a savings surplus instead. The slowdown has forced many banks to redirect their focus to retail banking and reinvent themselves as customer-centric organizations. But many institutions still use legacy infrastructures and processes that hinder necessary readjustments, in particular with regard to information exchange and customer communication. 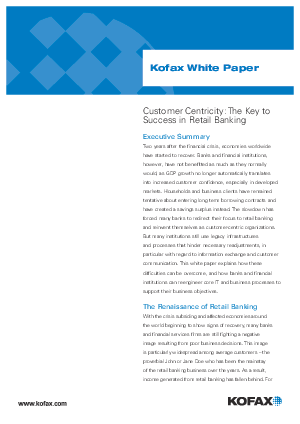 This white paper explains how these difficulties can be overcome, and how banks and financial institutions can reengineer core IT and business processes to support their business objectives.